Scotland "still have a chance" to qualify for the Euro 2016 finals despite losing in Georgia, according to former manager Craig Brown. Brown, who guided Scotland to the Euro 96 finals and the World Cup in France two years later, believes the Scots can progress from Group D.
"I still feel we have a chance," he told BBC Radio Scotland's Off The Ball. "I agree with Gordon that we didn't do enough to win the game [against Georgia] but we shouldn't have lost." 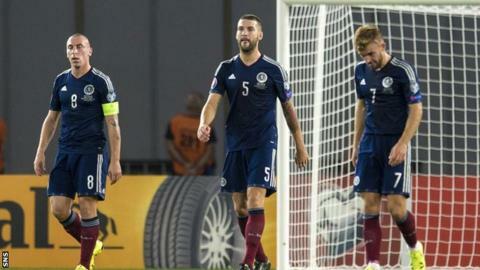 The loss in Tbilisi, coupled with Republic of Ireland's victory in Gibraltar, saw Scotland slip to fourth in the group. With world champions Germany visiting Hampden on Monday, Gordon Strachan's side will be aiming to breathe new life into their qualification campaign. After facing the Germans, Scotland also have a home game against Poland on 8 October, before finishing the group away to Gibraltar. "Forty-eight hours ago I was coming onto this programme [Off The Ball] to eulogise to say how well Scotland were doing and how brilliant Gordon is," said Brown. "I still feel he is and I still feel we have a chance. "Being Scotland, having lost to what you might call a minnow team, we'll beat the world champions on Monday, then we'll beat Poland at home. "The way we played against Germany and Poland [earlier in the Group D campaign] I don't think we need to be too pessimistic at all. "There's great pessimism now and you know what it's like with the press: you're polarised and either brilliant or hopeless. "This morning, I'm reading that we're 'hopeless' and 'abject failure' - things like that. "But it wasn't as bad as they're making out. There wasn't a shot on goal, I admit that, but it's very difficult when they pull everybody back as they did." Brown said he would not offer excuses for Scotland's display in Tbilisi, adding: "It wasn't a good performance. "But I think they're rated 49th out of the 54 countries in Europe; so it's not a good result. "I agree with Gordon that we didn't do enough to win the game but we shouldn't have lost. It was a perfect summing up of the situation. "I know teams, when they come to Hampden, they worry about Scotland. Germany are the world champions and have very accomplished players. "They won't be worried but they'll realise that they're in a game and I hope we prove that on Monday and against Poland as well."